The design of new catalysts is essential for making new and useful organosilicon compounds, which are in high demand in fields ranging from the medical to the electronics industries. A crucial step in this process is hydrosilylation (the formation of carbon-silicon bonds), and much interest has focused on rhodium-based catalysts known to be effective in accelerating this reaction. 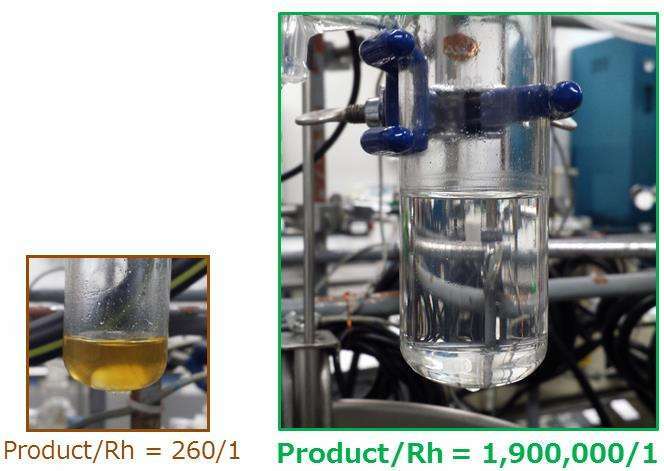 Now, Ken Motokura of Tokyo Institute of technology (Tokyo Tech) and colleagues have devised a new catalyst consisting of three core components—a rhodium (Rh) complex and a tertiary amine (NEt2) on silica (SiO2)—that significantly improves the hydrosilylation process. Reported in ACS Catalysis, the new catalyst achieved a turnover number of approximately 1,900,000 over a period of 24 hours, far surpassing other supported-rhodium catalysts developed to date. The co-immobilised amine (NEt2) is thought to be a key factor behind the improved catalytic activity. "Although the specific reason for improvement is still unclear, we know that usually the hydrosilylation reaction is accelerated by electron donation to the rhodium center, and the tertiary amine has electron-donating ability," says Motokura. The work builds on the research group's previous finding that co-immobilization of two active sites enhances catalysis drastically. The new study demonstrates that having both the Rh complex and amine on the SiO2 surface produces a greater yield (96%) than with just Rh (9%) or just amine (less than 1%), suggesting a synergistic effect at play. Notably, the order in which the Rh complex and amine were immobilised affected catalytic performance. Motokura explains that the timing of immobilisation may affect the positioning of the Rh complex and amine, which ultimately affects catalytic activity. This finding concurs with a previous study by the same team, which found that catalytic activity strongly depended on the proximity of the Rh complex and tertiary amine. One limiting factor for future studies is the high cost of rhodium. "In this study, it's important to note that we were able to achieve very low loading of rhodium," says Motokura. "We recognise that finding alternatives to rhodium will be critical. So far, however, catalysts based on inexpensive metals generally show low activity." The team's next goal is to produce a synergistic effect using non-precious metal and organic functions on the same surface, in order to achieve catalytic performance on par with rhodium-based catalysts. Motokura says: "If this succeeds, our long-held goal of developing sustainable solutions based on chemistry will be realized."